“A Paradigm Shift is a change from one way of thinking to another. 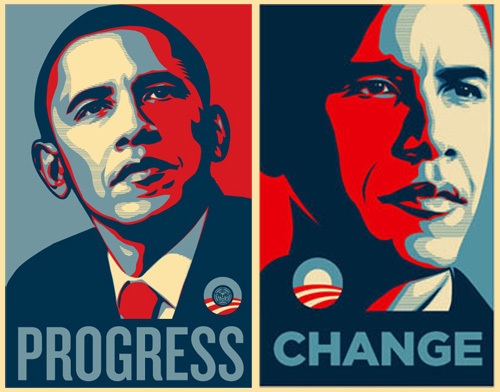 It’s a revolution, a transformation, a sort of metamorphosis. It just does not happen, but rather it is driven by agents of change” according to Thomas Kuhn; he believes that Change is difficult and that human beings resist change— awareness is prerequisite to all acceptable changes. A Paradigm Shift is when a significant change happens—usually from one fundamental view to a different view. In most cases, some type of major discontinuity occurs as well. Khun thinks that “a series of peaceful interludes punctuated by intellectually violent revolutions cause one conceptual world view to be replaced by another view”. What are these posters from the good senator’s camp? Martin Luther King, the second coming? I frankly like my version better. What can I say? the man can run! Look at him here on cruise control going the 100 meters on 9.68 seconds; this guy with all his antics was a breath of fresh air. This entry was posted in common sense, computer, my take, news, politics, sport and tagged digital divide, hussein obama, mccain, obama posters, paradigm shift, thomas khun, usain bolt by Michele. Bookmark the permalink. Excellent graphics! Usain’s accomplishment was amazing. During my last visit to Kingston Jamaica, I too wished I could run the 100 meter dash in similar time and avoid getting mugged. Too bad I’m not as fast and had to fork over some cash. So, I can understand why these guys are such fast runners! But Hussain’s Joe Biden pick was also dashing. It proves the old adage that politics makes for strange bed fellows! Biden was one of Obama’s most vocal critics earlier this year. But I agree, their ticket seems better than the alternative. Anyway, I guess change is the zeitgeist nowadays. Look at another Joe, Joe Liberman! Now, that’s change! Nice Topical Post..and interesting connection with Thomas Kuhn seminal work A Paradigm Shift. There is a temptation to feel jaded about the presidential conventions, with all of their careful staging and production values, but they are a chance for Americans to get a good look at the politicians who would be president. The impressions made at these obsessed-with-prime-time events can be defining. One part of Mr. Obama’s task will be easy: showing how much damage the Bush administration has done to Americans’ lives and their country’s reputation. I definitely like your version better. But isn’t it a waste of time to do politics? To work on politics? Well, it requires paradigm shift to agree. 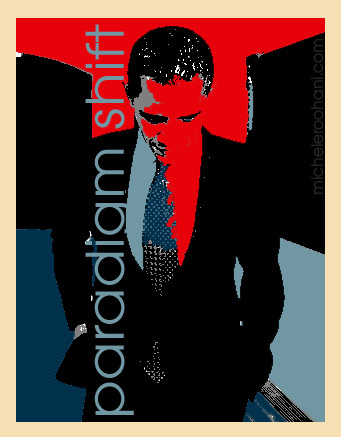 Isn’t it a waste of time to do a poster of politics, well again it requires a paradigm shift to believe. I admire you who did this for your son. Here you go I have also one for him. 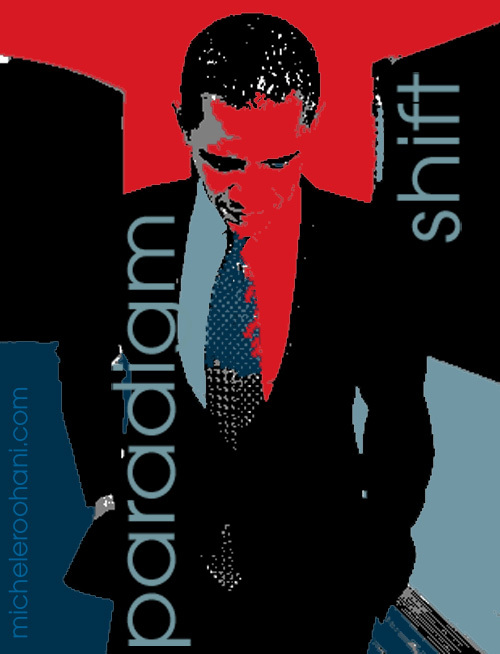 This is my kind of paradigm shift going away from working on love to working on a political figure. But isn’t it worth while to make your son happy? I am sure it does, so I am happy too doing this reverse shift for an hour to make a difference in my life, not to stick on one paradigm for ever. Very appropriate, very thoughtful. Thomas S. Kuhn on the nature of scientific revolution in this case is truly applicable. It is in the core of human frailty that we are scared of novelty. It was always so. Witchcraft as opposed to the elegance but lean mathematics. The choice is scary. Michele, yours is the only blog I read faithfully. I always know I can find wisdom there and a challenge to my paradigms. What I find really scary is that this election is even close. How many times are the american voters going to be hoodwinked into voting for a politician who is going to drive the country even farther into the ground by: increasing the powers of an imperial presidency, ignoring the constitution when it suits him, cutting benefits for the poor, and cutting taxes on the rich. Of course neither candidate is likely to restore more balance between the executive, legislative and judicial powers. . .